It feels like a family tradition now that we head over to Birmingham during the October half term and Halloween. With the children’s birthdays at the beginning of November it seems the perfect way to enjoy some pre-birthday fun during the holidays. This year is no exception and will be our last visit as a family of four so we intend to make the most of it. We’ve booked a couple of nights stay at the Birmingham Sutton Coldfield Travelodge which will serve as the perfect base for our adventures as well as a welcome resting place after fun-filled days around Birmingham. From Saturday 17th to Saturday 31st October, Europe’s only Thomas Land™ will be transformed into the spook-tacular island of Sodor. Guests can enjoy new rides Flynn’s Fire Rescue, Toby’s Tram Express and Captain’s Sea Adventure. And don’t forget to knock on the Fat Controller’s door for a trick or treat before you leave! 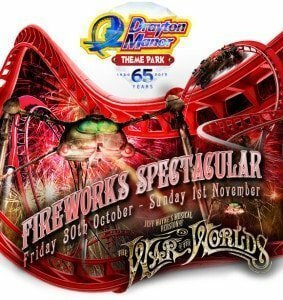 If that wasn’t enough for you their ‘War of the Worlds’ themed Firework Spectacular weekend taking place on Friday 30th, Saturday 31st October and Sunday 1st November. There’s set to be frighteningly good fun around every corner at Cadbury World this October half-term, as its Halloween Spooktacular returns from Saturday 24th October to Sunday 1st November. Expect plenty of hocus pocus and scary surprises at the Bournville based attraction, as it takes a spooky turn this Halloween. From terrifyingly tasty treats in the World’s Biggest Cadbury Shop, including exclusive handmade chocolate pumpkins, Crunchie Spiders and Cadbury Screme Eggs, to a special themed menu in the Cadbury Café and decorations throughout the attraction, it promises to be a spooktacular week at Cadbury World this half-term. Children also have the opportunity to unleash their own terror on the attraction, with a fang-tastic fancy dress competition taking place every day during the week. On the lookout for gruesomely good costumes, the brave judges will be handing out prizes to their most scary visitors. The spooks continue this autumn, as Count Duckula comes to Cadbury World in a brand new live entertainment show. Taking place in the attraction’s outdoor marquee on selected dates in October and November, join Duckula, Nanny and Igor in a race against time to solve the clues and find the long-lost treasure, The Jewels of Duckula. The Danger Mouse spin-off was last seen on TV over a decade ago, so his return is sure to be enjoyed by the whole family. For more information on the Halloween Spooktacular weekends and Count Duckula shows, or to book your visit to Cadbury World, visit www.cadburyworld.co.uk. Dive in to an all new Octonauts mission at The National Sea Life Centre Birmingham. From 18th October to 7th November, the National Sea Life Centre Birmingham is giving children the chance to discover more about the Octonauts crew. As cadets they’ll master the specialities of their favourite characters across six fun zones including Kwazii’s Rockpool, Dr Shellington’s Research Area and Professor Inkling’s Library. There’s even the opportunity to meet some of the characters in person before young enthusiasts are rewarded for their training with a very special Octonauts medal and certificate! The exciting characters will be making a splash for a limited time only so book early to avoid disappointment. This is an opportunity not to be missed! Visit www.visitsealife.com/birmingham for further information. Birches Valley Forest Centre is an excellent starting point for an exhilarating day out on Cannock Chase. Whether you are looking to enjoy a family bike ride through the forest, take a walk on the adventurous side of life with Go Ape or enjoy either The Gruffalo orienteering course or Superworm trail. After reading Here Comes The Girls review of the Hatton Adventure World Pumpkin Week I have had it on our must do list. Sadly we didn’t make it last year but this year I am hoping to take the children to enjoy the festivities. From the 24th October to 1st November Hatton Adventure World are running their Pumpkin Week, which allows all children to pick and take home their very own pumpkin. Alongside the pumpkin picking they have a host of different activities for the children to enjoy. What do you have planned this October half term? OOh I do fancy pumpkin week! ooh I love Cadburys world and never get bored of visiting there. I take school trips in activity weeks too and it is such a popular trip!